The Infinity Lock Box, containing prizes from nearly all previously-retired Lock Boxes, will be available again for an appearance beginning on PC on April 11th and on Xbox One and PlayStation 4 soon after. During this time, enemies defeated on both Ground and Space maps will have a small chance of dropping one of these prize-filled packages. When the Infinity Lock Box returns, we’re making some changes to make it easier than ever to acquire a Lock Box! 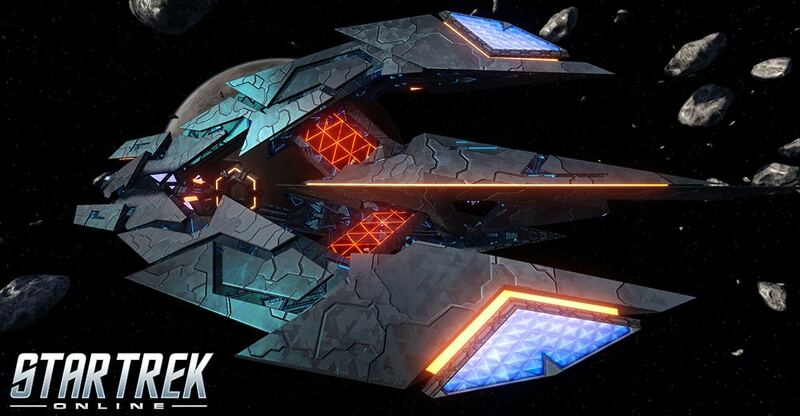 Starting April 11th on PC, you’ll be able to get the current lock box – in this case, both the Emperor’s Lock Box and the Infinity Lock Box – for free in the Dilithium Store. We’re also adding a bundle of twenty of each box, also for free, in the C-store! Due to its popularity among players, we will not be following our usual pattern of retiring the Emperor Lock Box, when the Infinity Lock Box begins this run. Instead, both will continue dropping in the world for a limited time, and the Emperor Lock Box will be retired at a later date. This run of the Infinity Lock Box will feature Tier 6, level scaling versions of the Tholian Orb Weaver and Tholian Recluse Carrier. Continue reading further on for the full details on these new starships! Includes a chance of winning a Hur’q Vanity Shield! New Tier 6 level scaling starships! Ongoing conflicts with the Tholian Assembly have resulted in a steadily growing number of captured Tholian vessels. The unique technologies used by Tholian vessels have taken a significant amount of resources merely to understand and make usable by humanoids. Recently, a team tasked with researching and improving Tholian technologies has made significant strides forward, allowing engineers to take these vessels and unlock and improve upon more of their unique abilities and design. The Tholian Jorogumo Carrier is the first Cross-Faction scaling ship in the Infinity Lock Box, and the Tholian Iktomi is similarly the first scaling ship available from the Lobi Store. For more on these powerful starships, keep reading! During its retrofitting process, the biggest improvements to the Tholian Jorogumo Carrier stemmed from a re-design of the lattice components that link the main ship structures. Changes to the internal environment to make it suitable for humanoid life had made this design be significantly less performant, and this re-design removed the bottleneck that had arisen there. As a final note on the retrofitting project, the team’s weapons experts believe they’ve finally unlocked the means by which Tholians simultaneously target the subsystems of several ships with such high precision. While this starship is uniquely suited to this tactic, the report suggests that, given enough practice, any officer should be able to replicate it on other starships. Activating this console creates a grid of Tetryon Energy between you, your hangar pets, and nearby allies, significantly increasing outgoing weapon damage for a short duration. Your hangar pets affected by the grid this way will additionally reflect Tetryon Beam Attacks at nearby foes. This console additionally provides a passive bonus to Auxiliary Power and Structural Integrity. This console may be equipped on the Tholian Carrier or Tholian Dreadnought in any console slot. While this trait is slotted, activating any Subsystem Targeting ability will additionally grant you Fire at Will I, as well as giving you a massive accuracy rating buff. The Tholian Jorogumo Carrier comes standard with two hangar bays of Tholian Mesh Weavers, and unlocks the purchase of more Mesh Weaver frigate pets, including the upgraded versions. These deadly frigates come equipped with Tetryon Beam Weapons and a Thermionic Torpedo, and use Fire at Will and Attack Pattern: Beta to efficiently tear through their enemies. They can be equipped on any Tholian Carrier or Dreadnought Cruiser. Like many recent starships, the Tholian Jorogumo can be used as soon as you complete the tutorial. If commissioned below level 40, some weapon, console, and bridge officer slots will be temporarily unavailable. This starship’s Hit Points increase with each level you gain. Retrofitting of the Tholian Iktomi likewise started in a redesign of the lattice structures to compensate for required changes elsewhere on the starship. On the Iktomi, the resulting improvements were most visible in improved communication pathing and better structural integrity. Those optimizations in turn allowed for higher limiters on the impulse engines and freed up more power for the ship’s shield generators. To ensure the new experimental optimizations, re-designs, and remaining Tholian technology worked together, a part of the team performed incredible feats and set up an increased number of safeguards around the ship. As a result of this work and the safeguards put in place, the ship has become a much more resilient testbed for field experiments. At the same time, another part of the team worked on improving direct control capabilities. This work, starting from the bridge and reaching all across the ship, significantly increased the effectiveness of the ship’s communication and fire control centers, making it more of a commanding presence on the battlefield. While performing this work and experimentation on such a distinctly alien ship, the team made significant use of photonic technology, both to safely explore areas of the ship that might still have a hostile environment, and to augment the team’s relatively small size. Continuous minor improvements made during this process, combined with the learning acquired from a complete bridge overhaul, have significantly increased the utility of the Photonic Officer on starship bridges. While these upgrades are most notable on ships with similar bridge configurations to the Tholian Iktomi, the applications of them are general enough to be noticeable on any starship. This console allows you to create an energy web around your target, capturing and eventually crushing them if they do not find a way to escape. Formation of the web will explosively fail if used on or near opponents that are too large to be captured. This console provides a passive boost to your Control Expertise and outgoing hull healing. It can be equipped in any console slot on any Tholian starship. You may only equip one of these consoles. While this trait is slotted, the duration of Photonic Officer is increased. In addition, while Photonic Officer is active, you will gain a significant boost to your Exotic Damage and Outgoing Healing. Like many recent starships, the Tholian Iktomi can be used as soon as you complete the tutorial. If commissioned below level 40, some weapon, console, and bridge officer slots will be temporarily unavailable. This starship’s Hitpoints increases with each level you gain. I don't see the advantages of scaling lockbox ships. Personally I would never buy a lockbox ship and open it on a low-level character. Those ships are just too pricey to open on a character that I might not keep. Also, one part of the fun of leveling a new character for me is trying out different types of ships at the different tiers, to find a play style that's fun and different than my other characters. If I open a lockbox ship on a leveling character, I would feel obligated to use it exclusively, to make it worth what I spent for it. I would like to hear different perspectives from other players.